What are we doing to tackle our recruitment challenges? 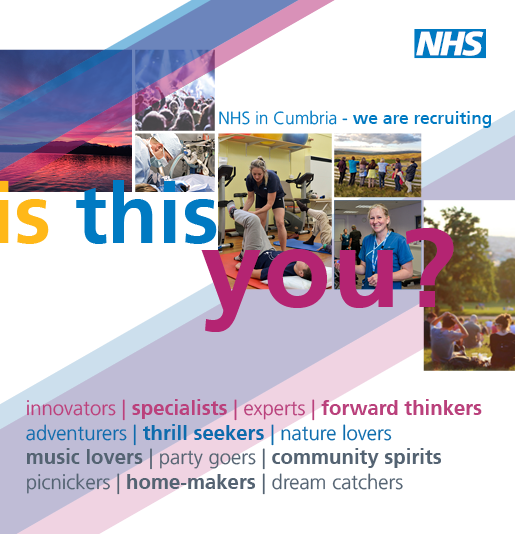 We’re working together to recruit health and care professionals in Cumbria. By joining forces we’ve strengthened our recruitment efforts and show off what makes the area unique. We have innovative roles and development opportunities that aren’t available elsewhere – making Cumbria a really strong choice. New recruitment brand – is this you? We have developed a new look for recruitment that describes the kind of people we’re looking for and uses images from local people showing what they love about living and working here. We’re looking for innovators, experts, adventures, thrill seekers, explorers, team players… the list goes on, we have something for everyone. Careers fairs and work with local education providers help us to showcase opportunities in Cumbria and develop innovative new roles. We’re encouraging new graduates and school students to stay in the area and developing local talent for the workforce of the future. Our recruitment team visit careers fairs across the country to encourage people to choose a career in Cumbria. We’re always looking for chances to promote our work and recently showcased the unique medical training programmes we offer on 21st century healthcare, a programme produced by ITN Productions in partnership with The Royal Society of Medicine. As staff shortages in the UK grow, international recruitment is a key element of developing our future workforce. We’ve recently visited Poland following successful recruitment trips by NWAS. By working together we have used their experience to recruit across the health and care system. These trips have proved to be cost effective and highly successful. We are building and strengthening our links with the UCLan at the Westlakes Science Park and developing roles which are part clinical and part academic. We also work closely with University of Cumbria which trains nurses, allied health professionals and midwives.